Travelling through China could be tough. Not only that very few Chinese can speak English (well enough to communicate), different dialects are spoken throughout China, making communication even more complicated. The standardized language in China is Mandarin (普通话), which was developed based on the speaking tones in the Beijing area and the language structure of the language used in the northern regions of China. In general, people in the north eastern part of China speak dialects which are similar and close to Mandarin, but in other regions of China, the language are usually completely different, either by different language types or subsets of the Chinese language. Some major dialects groups includes wúyǔ (吴语), which is spoken in parts of Zhejiang and Jiangsu provinces, including Shanghai; there's also yùeyǔ (粤语), which is spoken in Guangdong province, as well as Hong Kong; and the third largest dialects group mǐngyǔ (闽语), spoken in Fujian and some areas of South East Asia. Although Mandarin is used as the official language, only a percentage of the population speak it well, most people prefer to speak the dialects of their region. In the major cities, this is less of an issue, since almost everyone knows how to speak mandarin, possibly with an heavy accent. However, in the rural regions or minor cities, even a native Chinese can easily stride into unfamiliar territory as dialects could sound completely different even on two sides of a river or mountain ranges. Luckily for most foreigners almost all television shows and radio broadcasts are in Mandarin. This means even if the person can't speak back to you they might actually understand what you're saying. This is quite common in the rural south. Lastly the majority of minority languages, such as Tibetan or Uyghur, have completely different language roots than Chinese making them even more different from Mandarin. In some minority areas nationalistic feelings can be strong and some people will refuse to speak Mandarin entirely. This is a Chinese system that uses the 26 alphabetical phonetic characters, coming from the English alphabet, to help with the pronunciation the characters. It is used extensively in primary schools throughout Mainland China as an aid for learning to speak Mandarin, it is therefore also used by many foreigner when leaning Chinese. Pinyin is also the basis for transforming Chinese names to English, for example, when you are using an English map of China, all the location names would be in Pinyin. Each Chinese character is one syllable long and made up from three parts: the initial sound, the final sound and the tone. They can all be represented using pinyin, for example the Chinese character for mountain, shān (山), is made up from the initial sound sh, the final sound ān where the line on top of ā represents the tone. Pinyin is pronounced in a close way to the European system of pronunciation, but this is a trap for most people when learning Chinese. There are notable differences and because all Chinese characters are only one syllable long, one mistake may lead to a very different pronunciation. In mainland China all major roads, train stations, airports and subway stations will have signs pinyin written underneath the Chinese Character signs. This makes it much easier to navigate around China then compared to countries like Japan. Remember that even though pinyin is everywhere the majority of Chinese people quickly forget it after their youth and cannot read it themselves. It is also better to get notes written in characters to show Chinese people then notes written in pinyin. Those are the starting sound for each character, most are very close or the same as the English pronunciation, such as b, p, m, f, d, t, n, l, g, k, h, j, s. Some are quite different, and require a lot of attention when learning them, such as q, x, z, c, zh, ch, sh. For the later ones, a good advice is to actually hear them to get the hang of how they are really pronounced. Some Chinese characters have retroflex sounds which are determined by the part that makes up the initial sound. Those are the characters starting with zh, ch, and sh. Retroflex characters are spoken with the tongue bent backwards and slightly touching the roof of the mouth. Start the character in this position and finish the final sound as how it feels natural. One exception to this is the er (儿) sound, also called an end-r, that is sometimes used as an extension to the end of a character that also starts with a retroflex. This is used a lot in Beijing, where people will say things with the "er" sound at the end, although the meanings are the exactly the same. For example, instead of saying shì (事), the Chinese character for "event", people from Beijing will say shier (事儿). Sometime they even use this to shorten things, for example every other place in China people will say zhèlĭ (这里), the Chinese phrase for "here", but in Beijing people will say zher (这儿) instead. This is much more common in the provinces and areas around Beijing, and some of these dialects will end-r to the extreme. Other then that most areas of China will have a minor if no end-r at all, except on television. Sometimes called the "flat sounds", those are "opposite" to the retroflex sounds. The characters starting with z, c, and s are spoken with your tongue laying flat, touching the base of teeth. Because of different dialects, people from the northern part of China usually say the retroflex characters well, while the people from the south are likely to confuse them with the flat sounds. At some places of China people will speak Mandarin without any retroflex sounds. Interestingly, for the same reason, the people from northern China will often struggle with English, because they will roll their tongue too much. No one uses retroflex in place of flat sounds though, apart from none native speakers. For people not used to tonal languages this will be a major shocker. Mandarin is a tonal language meaning that the same sound has different meanings depending on the tone. Some times these meanings can be completely different. Mandarin only has 4 tones and a neutral tone. The neutral tone means that it is no tone at all and is just pronounced normally. The First tone is the flat tone, represented in pinyin by a flat line such as (ā). Second tone is a rising tone, represented by a raising line like (á). The third tone starts high goes low then goes high again in a smooth motion, represented likely using (ă). Fourth tone is a falling tone (à) and for many the hardest to do. The writing of pinyin is different then the writing of characters in one major way. In characters there are no spaces between different compound words. An example is 我是美国人, which means "I am American." If spaces were put in the phrase would look like this "我 是 美国人." In pinyin it would be written with the spaces between the different words like Wo Shi Meiguoren, once again "I am American." Luckily, there's one thing that travelers can always fall back on, and that is the writing. The literature system in China has become far more standardized when compared to the words spoken thanks to thousands of years of development. Simply put, the sentences may sound like they come from 2 different planets, but when it is down in written form, they are pretty much the same. There are two types of Chinese characters, which are Simplified Chinese (简体字) and Complex Chinese (繁体字). The simplified Chinese characters are developed around about 50 years ago by mainland China to form a standard and to reduce the number of strokes used in writing (thus simplifying the character set). It is used in mainland China, as well as other Chinese speaking countries such as Malaysia and Singapore. The complex Chinese characters are those that are used before the simplification and are mainly used in Taiwan and Hong Kong. Other forms of writing are also used in China, such as Tibetan and Korean, but to keep things simple, they will not be covered here. In this article, one of the the aims is to build up a repository of useful phrases that travelers can write down and use when all else fails. All Characters follow a certain stroke order. Similar how in English an "A" or an "E" will always be written a certain way, the stroke order on characters will always be written the same way. This is important to know for using dictionaries and other tools for figuring out the definition of characters, because stroke order is how it is organized. Most modern electronic dictionaries will tell you a character long before you finish writing it if you have the right stroke order. Basic characters like 人(ren), which means person, do not have radicals. These characters stand alone and have no other information on them. Another characters that does not have a radical is the character for wood 木(mu). Now if you place the radical of mu in front of it self you create 林(lin), this is one character and it means tree. Radicals get their forms from more basic characters and then appear in characters with more strokes. At one time these radicals would help give the definition of the character, and some still do, but in general it is only a guiding definition. Radicals help a travel break down a characters to make characters easier to understand. Learning a few of the more common radicals will make understanding characters much easier. As you travel around China your might get confused by names. On signs for certain places you might see several different names such as Huanghe, Huang He, Huanghe River, Huang River or Yellow River. This is because in Chinese the ending “hé” means river. So Huánghé means "Yellow River," while Huángshān means "Yellow Mountain," which are two completely different place and are very far from each other. To make something a river, mountain or lake one just has to add that ending to the word. It is best to memorize some of the most common endings in order to make it easier to travel in China. The characters are listed with the numbers here but for all purposes on mainland China arabic numbers are used. Therefore learning Chinese characters for numbers is not very useful, unless travelling in Hong Kong, Macau, Taiwan and Japan. Notice that you can construct the numbers that are 2 digits and above. So 135 would be Yì Bǎi Sān Shí Wǔ (一百三十五), which is literally one hundred, three tens, and five. This works for any digits listed above, unless there are zeros between the digits, and you omit them by using the character Líng (零) for zero. For example 50,001 would be Wǔ Wàn Líng Yī (五万零一). Notice the character zero only needs to be used once (unless if the zeros are seperated). For those serious Chinese learners, also notice that when you speak, the character for one Yi (一) has different tones. When it's in the first digit, it has a flat tone Yī; but when it is used before the characters hundred and thousand, it become Yì, the fourth tone; and when it is used in digits even higher, it changes again to the second tone Yí. So for the number 11101, it become Yí Wàn Yì Bai Líng Yī (一万一百零一). Chinese names for countries can be completely different from what you expect. Here is a short list of country names for Chinese. If you want to say a person from that country add rén (人) to the end of the country name. Example America is Měigúo (美国), American is Měigúorén (美国人). Question sentences are an interesting structure in Chinese. Most question sentences will end with the participle ma (吗). This participle implies a question. Now if a question word is used such as shenme (什么), which means what, then the participle will be dropped. Therefore take care when forming question sentences because leaving out the ma or adding in an unnecessary ma can be very confusing for speakers. How much does this cost? = zhège duōshǎo qián? (jigger dwo shao chyen) 这个多少钱? Where is the toilet? = xǐshǒujiān zài nǎ(r) (she show jyen zai nar) 洗手间在哪(儿)? People don't usually say the 24 hours time in speech, so before saying the actual time they first say which part of the day it is. Shàngwǔ (上午) is used for morning, while afternoon is Xiàwǔ (下午) and night is Wǎnshàng (晚上). You can tell the time by using a number (see the numbers section) followed by the character Diǎn (点) for O'clock then followed by another number and the character Fēn (分) for minutes. So 1:35 pm is Xiàwǔ yī diǎn sān shí wǔ fēn (下午一点三十五分), literally meaning afternnon one O'clock and three tens (thirty) and five minutes. Does that sound complicated, especially the minutes part right? You have to construct the nuber of minutes using a number then the character ten and another number... >_<!!! Well, there's a short cut, if you're the one speaking (or writing), you can round the time to the nearest quarter, Yīkè (一刻) for 1 quarter, Bàn (半) for half, and Sānkè (三刻) for three quarters. Trying 1:35pm again, it becomes Xiàwǔ yī diǎn bàn (下午一点半), which is a lot better. Notice it's an approximation and you don't have to use the character Fēn (分) for minutes anymore. For the following you can omit the character for station Zhàn (站), people use the same word for the actual train and the station to shorten things. You will likely to need to mention a certain route to take inside the city, in this case, you need to add a number, followed by the character Lù (路) meaning route. So bus route number 17 would be Shí qī lù gōnggòngqìchē (十七路公共汽车). If you're taking a tram then use the phrase Diànchē (电车) instead. One thing to note, if you're taking a route with a three digit number, the ones are pronounced as Yāo instead of Yī. This means if you're asking for bus route 111, you would actually say Yāoyāoyāo instead of Yīyīyī. But if you're writing this down you just write 111 and not 幺幺幺 (for Yāoyāoyāo). 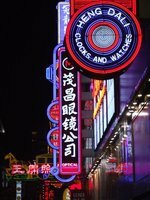 Eating in China is going to be a real experience for anyone, see the complete guide to food in China for the finer details. 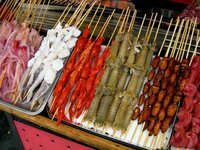 However, people quickly find that food in China is very different to the Chinese food back home. In a restaurant that doesn't provide an English menu, or just at local eat outs, knowing what to order could mean a fantastic experience or staring at something you'd rather pass on. This section explains to you some of the basics of the food and the names given to how they are prepared, so you can have at least some idea of what you're ordering. To start of, here are some words that describes the taste of the food. These could appear at the start of the name for a dish to describe its taste, or in the middle to describe the taste of one of its ingredients. Knowing the above tastes, if you see a dish called "酸辣汤", you would know it's going to be sour and spicy. Hóngshāo (红烧): Cooked using soy sauce in a slow, casserole like way, usually with sugar added. Like the taste, a cooking method usually makes up the start of a dish's name, for example, if you see "清蒸鲫鱼" you can bet that this is a steamed dish. The last part of a dish's name usually describes the thing that's being cooked. Same as in English, the word that follows fried is usually the "what". Zhūròu (猪肉) or just Ròu (肉): Pork, actually the character 肉 just means meat, it can be used like 鸡肉 meaning chicken meet or 羊肉 meaning lamb. But because the wide usage of pork in China, the character 肉 by itself usually just refers to pork. Jiāo (椒): Pepper, type is determined by what goes before this character. Qīngjiāo 青椒 is green capsicum and none spicy. Following on the example in the last section, you should now be able to tell "清蒸鲫鱼" is steamed and it's a type of fish. Here are a list of the types of dish, the names also used at the end of a dish. Mántou (馒头): Chinese steamed bread, but in Southern China, it is always confused with 包子. It is quite flavorless. Once again, combined with some of the things we learned earlier, we can make out some dishes already: 酸辣汤 is a hot and sour soup, while 麻辣火锅 is a spicy hotpot. This is version 65. Last edited at 0:07 on Feb 8, 09 by Lavafalls. 17 articles link to this page.